Another week has come and gone and here I find myself at 30 weeks pregnant. Only 10 more weeks to go (and if I’m lucky at all, a little less than that.) I guess I can say it’s crunch time for getting everything on the baby to-do list checked off. Let’s get this weekly pregnancy update rolling shall we? Baby Size: Baby Wes should be clocking in around 2.89 lbs and 15.7 inches long. That puts him, according to The Bump, about the size of a zucchini. Symptoms: Rib aches, heartburn, difficulty getting comfortable while sleeping, swollen ankles, constant desire to lose the bra. The list could go on for miles at this point. Sleep: Lacking these days. And when I do get a good night full of sleep, I wake up with so many aches and pains that it doesn’t really feel like a good nights sleep. Not to mention I’ve been fighting a 2-year-old this week for pillow space. Cravings and favorite foods: Hibachi which I indulged in the other night. I’m quite positive that didn’t help with the swollen feet one bit. But it was delish, as were the left overs the next day. Mood: Tired and crabby. As I mentioned last week, I’m trying to cram in a ton before the baby is born. That plus just being slow and tired doesn’t help motivate me for the typical house hold chores (like laundry.) So things pile up which make me crabby. Yet, I don’t have the energy to do anything about it. So is the story of my life right now. 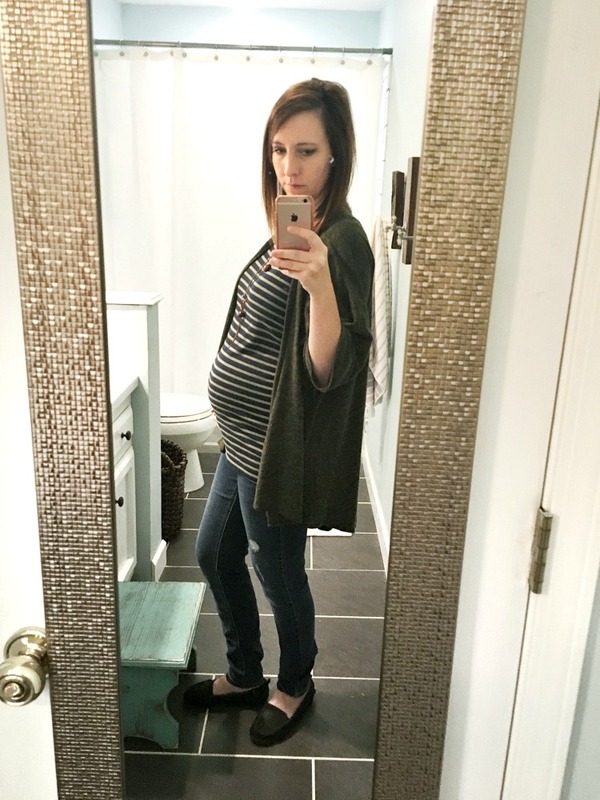 Maternity clothes: Today I am wearing a Target striped top with my favorite Motherhood Maternity jeans with the side panel instead of the full belly panel and a kimono from LulaRoe since it’s a bit cool and rainy again. I’m loving kimono’s this pregnancy. The bigger and flow-ier the better. Buying: I’m excited about this week’s purchase. We never had a movement monitor with Aspen, in fact, they were still relatively new when we had her and it wasn’t even on my radar. But knowing now how little sleep I got in those first few days because my anxious mind would stare at her while she slept to make sure she was still breathing, I decided that this would be a must for baby #2. So I read and reviewed all the monitors out there, talked to friends and then did, even more, research and we decided to get the Snuza Hero Baby Monitor. I liked how this was small and compact, I can easily pick the baby up for feedings in the middle of the night without having to pause anything. But I mainly loved the fact that if it senses no movement for 15 seconds that it will begin to vibrate as a first attempt to arouse baby. I’ll make sure to come back and update you later on how this holds up. Aspen’s Reaction: Have you guys seen Boss Baby yet? We watched it with Aspen last night. She was excited about the baby movie, I am hoping it didn’t put any wicked thoughts in her head, like shooting the baby out the window. And what was with all the scary movie references like The Exorcist and Walking Dead? Creepy!